Looking to boost productivity in your warehouse and smooth workflow? Its potentially time to consider whether traditional WMS wave processing or order streaming can work for you. 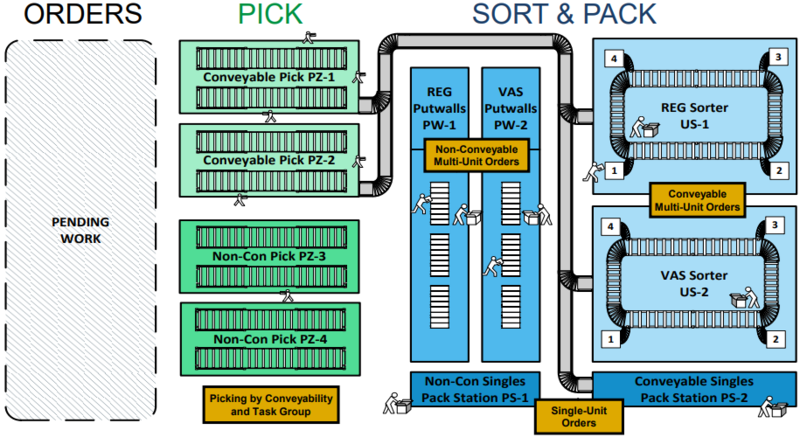 In most warehouses the biggest contributors to bottlenecks and wasted time are picking and associated travel as well as coordination and flow between functions such as transfers from picking to sortation and packing. Wave processing has been around for a very long time and is native to most WMS products. The core of waving is that it selects and organises your pool of orders into tasks and activities for execution in the warehouse, typically on a batch level based on pre configured criteria such as route, customer and cut off time. Waving has and still is one of the best ways to organise, plan and execute the outbound work, the core issue has always been that work is released in batches, which create tasks for pickers enmass and can lead to bottlenecks in your warehouse based on people and equipment capacity and constraints. Order streaming is a feature of your WMS which looks at the capacity constraints of the entire facility and then releases work as and when it is required to smooth the flow and ensure that resources are consistently and optimally utilised. The beauty of order streaming is that it does this automatically, without the need for human intervention. 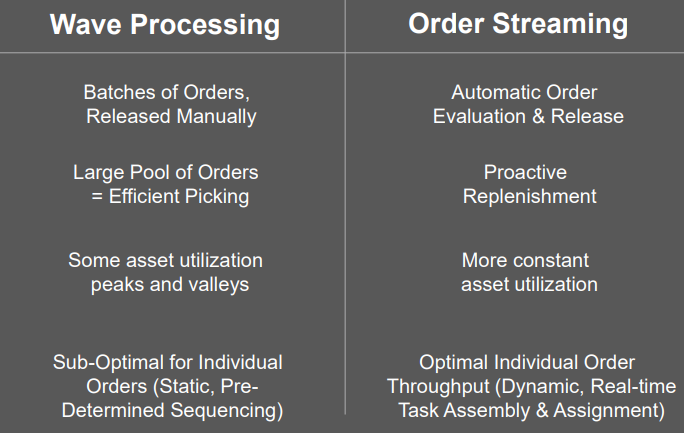 Order streaming is not completely different from its predecessor, wave processing, but rather it leverages the strengths of batch fulfilment at the same time as optimising processes for better individual order handling. Your WMS does this by conducting ongoing evaluations of your order pool, picking activity and downstream MHE allowing you to prioritise orders and expedite high-priority or urgent orders through the system. The system flags high-priority orders and borrows stock from a task in progress, to fill the urgent order first - allowing your warehouse to be responsive and adaptive. This video from Manhattan Associates explains how order streaming can be used to streamline your warehouse operations by ironing out labour peaks and valleys. Order streaming will help you eliminate bottlenecks and reduce the lead time from order capturing to order fulfilment. The two main benefits of order streaming are that it saves time and improves asset utilisation, which ultimately translates to improved throughput in your warehouse. Your WMS continuously evaluates your order pool, prioritising orders and advancing them through the process without human intervention. Your WMS proactively replenishes forward-locations to prevent wasted trips to bins that are out of stock or don’t have sufficient inventory. High priority orders are completed first to deliver excellent customer experiences. Your WMS automatically delays task creation and assignment until the labour and/or equipment needed to complete the task becomes available. This eliminates bottlenecks. Order streaming utilises pull-based rather than push-based processing. This means that you WMS monitors capacities and constraints accurately, in real-time, keeping the process responsive, rather than building a static plan with waves based on predicted capacities. Order streaming allows you to meet ever-increasing customer demand in an omnichannel retail environment. Not only will you be able to boost productivity and profitability in your warehouse, but you’ll also be able to delight your customers with world-class customer service. Stay on top of the latest trends in supply chain management! Subscribe to our blog for tips and insights from our supply chain experts, to help you benchmark your warehouse against world-class best practices and stay ahead of industry trends. Want to see what a world class supply chain looks like in action? Download the Tarsus Distribution case study to see how Tarsus (in partnership with Supply Chain Junction) used Manhattan SCALE to increase their warehouse efficiency by 60%.